Exclusive offer: Contribute Rs 19,999 or more and get a FREE ticket (worth Rs 14,999) on a Swarajya Heritage trip of your choice, subject to availability. First, highlight gross misgovernance in affairs relating to Indic heritage by culturally iliterate government bodies. Second, promote heritage tourism through our tours and encourage appreciation of our art/architectural wonders. Third, invest in meaningful in-depth reportage on heritage issues such as idol theft, protecting monuments and cultural practices. Do support us by buying a sponsorship. You can sponsor as little as Rs 2,999. Questions? Please write to subscriptions@swarajyamag.com and we will get back ASAP. You are welcome to make a transfer or send a cheque. Do email us details about your payment so we can acknowledge and keep you posted about our program. Write to us at subscriptions@swarajyamag.com after you process the transfer. Write to us at subscriptions@swarajyamag.com (with the courier tracking number) once you send in the cheque. We will be using the proceeds from this program towards producing in-depth reportage on heritage related themes, on promoting heritage tours curated by Swarajya and in advocacy relating to getting governments to give up control over temple administration. Will sponsors receive any updates? We will send out an update to all sponsors once in every three months. We will also be communicating about our activities through our articles, podcasts and videos over the next few months. Who do I reach out to for questions/queries? Please write to subscriptions@swarajyamag.com and we shall get back to you as soon as possible, usually within 24 hours. How about paying by cheque or electronic transfer? You are welcome to make a transfer or send a cheque. Please see details below. Do email us details about your payment so we can acknowledge and keep you posted about our program. HDFC Bank, Peelamedu Branch, Triyambava Kalapatti Main Road,Coimbatore. 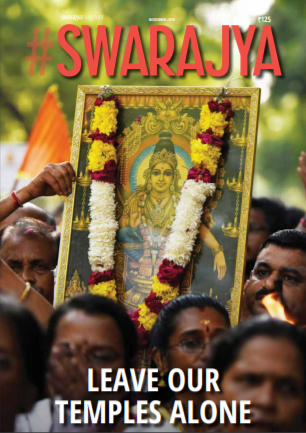 Write to us at subscriptions@swarajyamag.com (with the address where you want the copies to be delivered), once you finish your transfer / sent in the cheque.